At the end of the day...... a great evening was had by all..... Apart from Leon! As we are all well aware, Leon joined round table later in life. He has been a member for the last 5 years. Round table is what you put into it.... and Leon has done his fair share during his time in Round Table, he has entered the Christmas day swim, organised the Bonfire and firework display and participated in various other Round Tables events. Sadly Leon’s time has come to an end as a Round Table member, and at the grand age of 45 its time to get rid of the long in tooth and make room for younger more able members. Scrooge Espley’s chuck out started off at Searls Country Club and driving range, where Seals Captain and finest golfer Leon, managed to miss every target on the driving range. For his incompetence as a Golfer, he was punished wish several Shots! After a change of venues, we found ourselves at Heacham boat club, where the drinking games continued; as the shots were free Scrooge Leon felt only too obliged to continue loosing, making the most of the free drink. Everyone was pleasantly enjoying the evening meal until Scrooge stood up and attempted to address the audience with a speech, immediately alarm bells began to ring as everyone remembered Leon’s Christmas speech a few years previous……… Well done Leon, you certainly topped it…….along with several of the audience topping themselves. 1 hour and several “at the end of the day”s later we were all well aware that Scrooge joined round table later in life and Round Table is what you put into it! 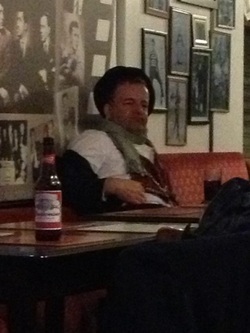 Fortunately Scrooge had well and truly succumbed to the effects of alcohol and shut up. After watching a short Video “the ghost of scrooge Espley” I believe Leon had finally began to realise the errors of his ways, he reached for his wallet and staggered towards the bar. Dust clouded the room as his wallet was removed from his pocket; he flicked the moths out of the way as he reached for a fiver to buy us all a drink. A great evening had by all, and hopefully the last of scrooge Espley’s Speeches! 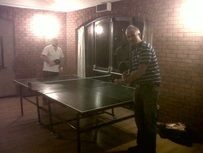 Andrew’s meeting saw tensions rise as the table tennis tournament begun. As usual, Jacko and Garry saw their only hope of winning was to cheat from the beginning! After the tournament we enjoyed a meal at Searls and washed it down with a few karaoke tunes, where Kevin was out sung by a 20 stone 60 year old Jackie Wilson. The MGM arena Ringstead hosted the Super Heavy Weight Round Table tournament. 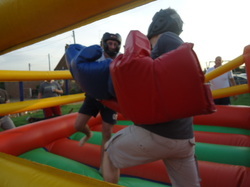 The evening saw all members verge on a mild heart attack as they pounded each other with gloves the size of Nathans arm! Surprisingly the inflatable ring withstood the heavy weights as they ducked, dived and fell out of the ring! As the evening came to an end we sat down to a BBQ and beers. Another great evening thanks to Leon. This years Chairman’s BBQ consisted of 7 Table members and a drunken Mexican. An early start on Saturday morning saw us arriving at Norwich. We were swiftly greeted by City Tours very own Catweazle, piled into 2 boats and sent on our way to the string of pubs to sample some traditional beers! Boat 2, the more sensible diesel powered craft, consisted of Chris, Buster, Garry, Kev and Welzie when he decided to abandon his own boat and leap aboard. A great day was had by all, except having to wait for the overloaded electric powered tub to catch up. 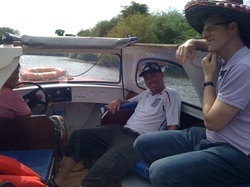 We spent the day cruising from Norwich to Bungee stopping at several pubs on route. The idea of BBQ went out of the window when a bunch of ravenous tables arrived at the first pub and ordered lunch! Amazingly the batteries held out and Joe and his crew managed to crawl back to the mooring on time. A special mention should be given to Captain Craig, who done his best to steer the boat, despite running aground in the reeds! I now believe the only reason the electric boat could not keep up was because it had to cover twice the distance, as Craig tacked vigorously across the entire river.